stylos: Wilken on the early Christian redefinition of "religion"
Wilken on the early Christian redefinition of "religion"
Celsus sensed that Christians had severed the traditional bond between religion and a “nation” or people. The ancients took for granted that religion was indissolubly linked to a particular city or people. Indeed there was no term for religion in the sense we now use it to refer to beliefs and practices of a specific group or people or of a voluntary association divorced from ethnic or national identity…. The idea of an association of people bound together by a religious allegiance with its own traditions and beliefs, its own history, and its own way of life independent of a particular city or nation was foreign to the ancients. Religion belonged to a people, and it was bestowed on an individual by the people or nation from which one came or in which one lived… (pp. 124-125). I am struck at how Christianity not only introduced a religion that transcended culture but that it was based on personal, individual beliefs and practices. It teaches the necessity of conversion, repentance, and faith. For those in the Western world, influenced by the success of the Christian movement, we take it for granted that this is the way religion works. 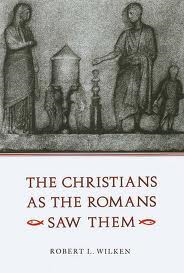 This was not, however, the way pre-Christian, pagan Romans viewed religion, and this is likely not the way people in cultures not influenced by Christianity see it.